A $10 billion quarterly loss has apparently sparked a Securities and Exchange Commission investigation into General Electric’s (NYSE: GE) financial accounting. The investigation initially began in late November and focused on long-term service agreements for maintenance of power plants, jet engines and other industrial equipment. The investigation was recently expanded to include a $6.2 billion charge to increase insurance reserves and $15 billion more in provisions for insurance policies. The investigation is just the latest blow to the nation’s largest industrial conglomerate. The company has also been struggling with steep declines in profit in its power and transportation divisions. Its shares have fallen 43 percent over the past year. The company is now looking to shed about $20 billion in assets. The company’s lighting and railway locomotive divisions are already up for sale. GE reported quarterly results on Wednesday. GE said sales fell 1 percent to $122.1 billion in 2017 and operating profit margins contracted by 5.7 percentage points. Total revenue in the quarter fell to $31.40 billion from $33.09 billion. On a per-share basis, GE reported a loss of $1.15, compared with a profit of 39 cents per share last year. 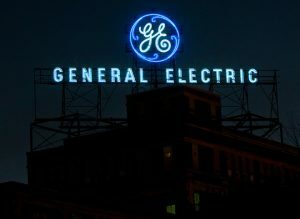 Profit fell 88 percent in GE’s power business in the quarter, after a decline of 51 percent in the third quarter. The drop was attributed to unspecified charges and other factors. Revenue and orders also fell sharply at the power unit. Its power business unit produced 60 percent of GE’s profits as recently as 2016. Last month, the company announced it would eliminate 12,000 jobs in the power unit. Chief Executive John Flannery said the industrial businesses were fundamentally strong despite its current challenges. Revenue for the aviation division was flat at $7.2 billion and the health care business saw revenue grow by 6 percent to $5.4 billion. The fourth-quarter results contained no other sizeable charges. The company has affirmed its outlook for earnings of $1 to $1.07 a share in 2018.